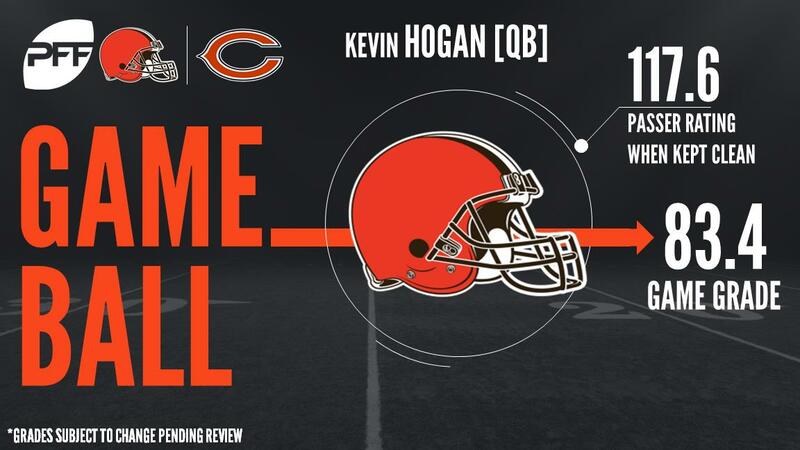 Browns QBs Kevin Hogan and Cody Kessler looked good on the stat sheet, combining for three touchdowns and 302 yards through the air, but it was the defense that shut out the Chicago Bears for the 25-0 victory. Bears rookie QB Mitch Trubisky struggled to just 2-of-5 passing and just 10 yards in his preseason finale, while QB Connor Shaw saw extended action. With that, we give you our PFF exclusive takeaways from the contest for each team. Both Browns quarterbacks managed to move the ball decently against Chicago’s defense, although Hogan was the more impressive of the two in this game. Cody Kessler’s highlight was hitting WR Rannell Hall on a back shoulder pass under pressure at 2:42 of the second quarter, but he otherwise struggled with inaccuracy at times, which wasn’t a problem for Hogan. The Browns’ second-half starter completed 13-of-17 aimed passes, and five of his seven throws that traveled at least 10 yards in the air. While Hogan’s performance under pressure wasn’t ideal (39.6 passer rating with two sacks), the rest of his game, notably a pair big-time throws including his touchdown at 11:18 of the fourth quarter, should give him a legitimate shot at making it through the team’s final round of cuts. Drango was one of two Browns to go the distance, splitting time at both guard and tackle for the second time this preseason. However, the results were mixed; like last week, he graded well as a pass-blocker, allowing just a pair of pressures in 45 snaps in pass protection. Conversely, Chicago’s front gave made for a tough time in the run game, particularly John Jenkins, who bested Drango several times, including for a defensive stop at 1:37 of the first quarter. Thompson was among the standouts in Cleveland’s shutout effort. He converted one of his 14 passes rushes into pressure, but most of his impact came in run defense, where he was a disruptive force at the point of attack, giving Bears lineman Taylor Boggs trouble on multiple plays, both at guard and center. Among his highlights against Boggs were a holding penalty and a shed-and-tackle at 8:41 of the third quarter. On the edge, Holmes continued his fantastic preseason with another solid effort in both run defense and as a rusher. The second-year rusher racked up a team-high six pressures in 31 rushes (two of those plays were nullified by penalty), while tying for the team-high with three defensive stops against the run. This was an interesting game for Trubisky; he played most of the first half, but didn’t throw his first pass until the second quarter, despite three separate drives in the first. He ended with a pedestrian statline, going 2-of-5 for 10 yards, with only one of those passes traveling more than 10 yards in the air. In a game that ended in 0 points for the Bears’ offense, there aren’t many positive performances to note, but one of those was from Pruitt at tight end. He hauled in all three targets for 63 yards, including two first downs, one of them a highlight reel 52-yard gain near the end of the fourth. To go with his work as a receiver, Pruitt made a pair of positive blocks in the run game, in addition to a tackle in kickoff coverage. Jenkins made the most of his 50 snaps to finish the preseason, making numerous positive plays in run defense, either by standing up his blocker and squeezing the point of attack, mostly against center Austin Reiter and guard Spencer Drango, or shedding to bring down the ball carrier. Jenkins finished the game with three stops in addition to getting in on second quarter sack. Chicago had multiple linebackers grade highly in this game, both on the edge and at the second level. Irving compiled the best grade of the group with two sacks and four other pressures in 36 pass rushes, while inside linebacker Nick Kwiatkoski got in on two sacks in his three blitzes. John Timu was another inside linebacker who graded well, but unlike Irving, it was primarily due to his play against the run, where he finished with a team-high five run stops.